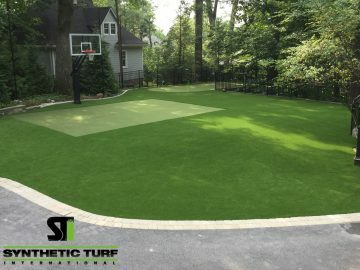 This featured application was installed by Joe Nardolillo with Tee To Green/STI of New Jersey. The installation was located in Summit, NJ. SoftLawn® Fresh cut Pro was used for the lawn, NP50 for putting surface and NP45 for basketball court. This job is 3800 sq. ft. and replaced existing Turf that was poorly installed by another company. Previous installer did not use tape or glue and had big nails popping out of the turf causing a very unsafe environment for the children to play on. Joe and his team were referred to this client by a large landscape company to do the job correctly by adding stone and stone dust and using the proper installation materials needed to create a lawn and play area that is safe for the family to use. Both the home owner and referring landscape company couldn’t be more pleased with the outcome of this project!